Lately Marcy and I have been stepping up our game for food and wine pairing. I got a few books on pairings and I’m starting to get to the point now that I can create a dish on the fly with no recipe that pairs really good with the wine we selected for the evening. 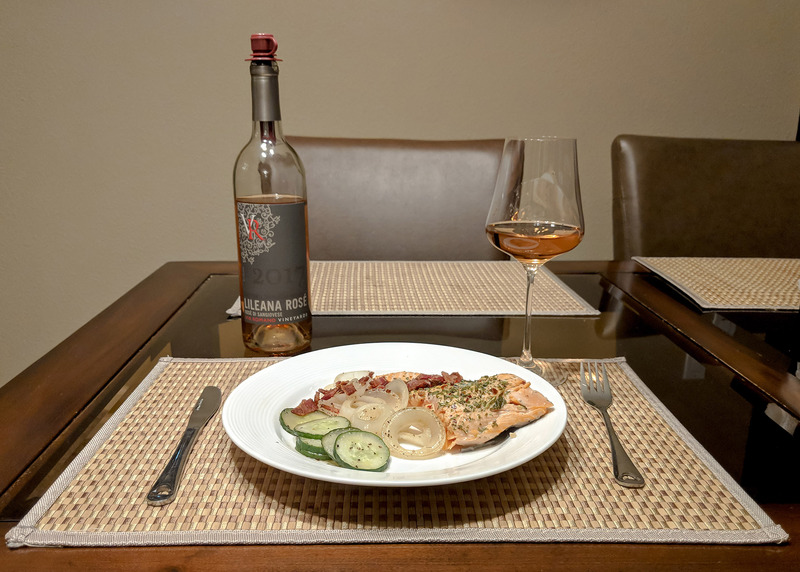 Tonight we had a 2017 Via Romano Lileana Rosé which is Sangiovese Rosé paired with a poached salmon. I didn’t follow a recipe for the salmon but I did a few things to make this dish savory and delicious! First I got a few strips of bacon and threw in the air fryer to make it crispy. After that I sliced a few onions and gave them a quick sear in a pan with some olive oil, butter, salt and pepper on medium-low heat. When the onions were about browned I chopped up some garlic and threw it in the pan as well. I then added a 1/4 cup of water and about a 1/4 cup of the Lileana Rosé and raised the heat to medium. The salmon preparation was easy. I just dried it and then shook on a little kosher salt and pepper. We have our own mix of dried herbs from our garden which consisted of basil, rosemary, oregano, and thyme. I gave the salmon a generous sprinkling of that as well. 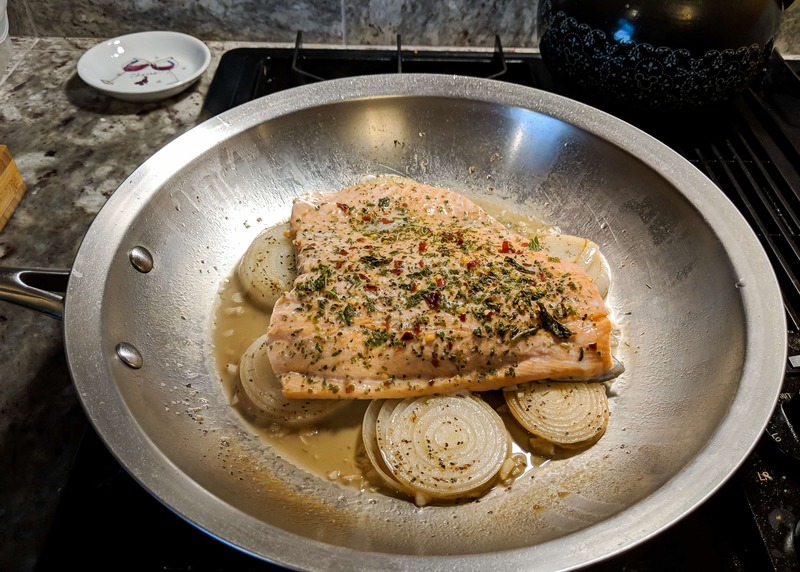 I finally added some red chili pepper flakes and then put the salmon the pan right on top of the onions with the lid on to poach it for a few 5-10 minutes. While the salmon was poaching I took some left-over raw cucumber slices from the night before and cooked them in another pan with some olive oil, butter, salt and pepper. By this time the bacon was done so I took out the oven, chopped it and set it aside. The salmon was about done and just before I turned off the heat I sprinkled some dill weed on it and let it rest for a few minutes. All I had to do after that was plate everything and sprinkle it with a few drops of lemon juice and the bacon. Now for the taste! The salmon had some saltiness from the bacon and some very mild heat from the chili pepper flakes. The herb mix combined with heat from the peppers made it taste like a hint of green peppers and that paired nicely with acidity and summer strawberry taste of the Rosé. It was amazingly good! I got more ideas for pairing in the works so stay tuned for our next great meal! While I had no recipe for this meal here’s the recipe I created for the Poached Salmon. Crushed Red Pepper Flakes, To taste. I was fairly generous but this wasn’t spicy hot at all. Prepared as stated above! Enjoy!